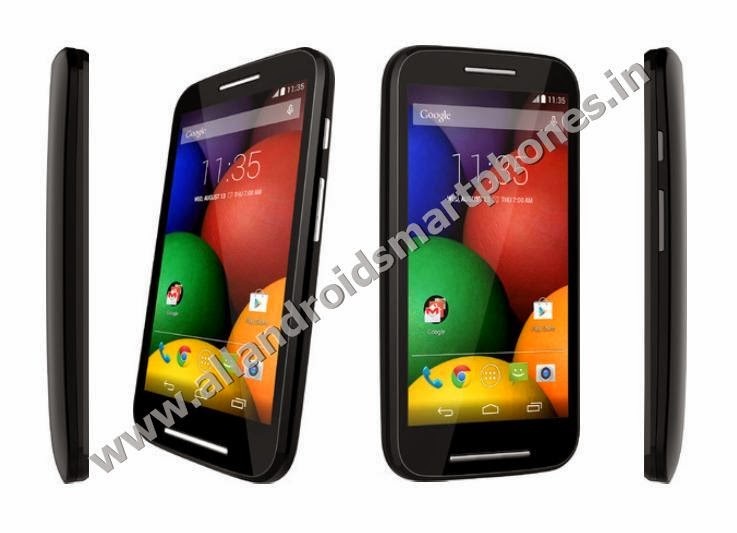 Motorola Moto E Android KitKat 4.4 Smartphone Specs Review Price. ~ All Android Smartphones Mobile Phones Tablets Review Price. 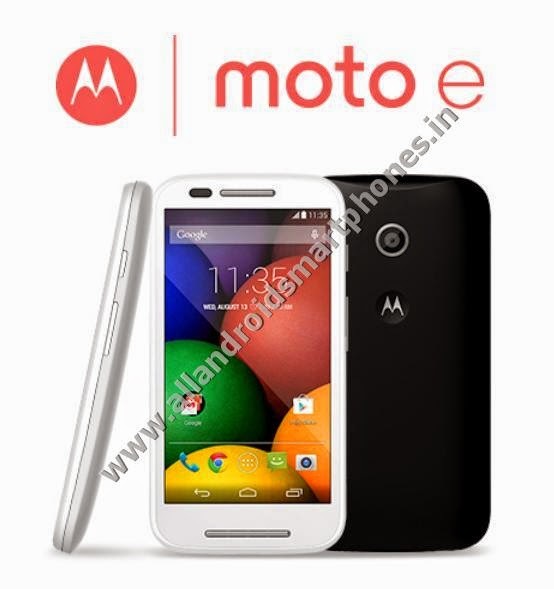 Motorola Moto E Android KitKat 4.4 Smartphone Specs Review Price. Motorola Moto E XT1022 is a 3G enabled Dual Sim Android v4.4.2 Kit Kat OS Smartphone with 4.3 inch Capacitive touchscreen having 16M colors with 540 x 960 pixels display resolution, 256 ppi pixel density and multitouch support. The screen is well protected by Corning Gorilla Glass 3 and a water-resistant splash guard. The dual sim dual standby android phone uses micro sim card. The phone dimensions are 124.8 x 64.8 x 12.3 mm and it weighs only 142 grams. The phone supports loudspeaker, 3.5mm audio jack and Vibration, MP3, WAV ringtones for notifications and call alerts. The phone comes with internal phone memory of 4 GB with 1 GB RAM and supports external microSD card up to 32 GB for memory expansion. The phone incorporate 5.0 MP main rear camera with 2592 х 1944 pixels resolution and supports geo-tagging and video record 854x480@30fps. The phone doesn’t have a front secondary camera for video chat. The phone runs on v4.4.2 KitKat Android OS and uses Qualcomm Snapdragon 200 chipset, Dual-core 1.2 GHz Cortex-A7 CPU and Adreno 302 GPU. The phone supports accelerometer and proximity sensors. The phone uses a non removable Li-Ion 1980 mAh battery which gives a mixed usage battery backup time up to 24 hours. The phone comes in black, white colors. The box contents include handset, headset, electric charger, USB data cable, user manual and warranty card. Explore Motorola Moto E XT1022 Dual Sim 3G Android Smartphone Latest Features, Model Specifications, Preview, Images, Photos, Comments, Details, Review and Price in India. The Android smartphone supports GPRS, EDGE, 3G speed HSDPA 21 Mbps, HSUPA 5.76 Mbps, WLAN Wi-Fi 802.11 b/g/n, Wi-Fi hotspot, microUSB v2.0, Bluetooth v4.0, LE, SMS(threaded view), MMS, Email, Push Email, IM, HTML browser, FM Radio, GPS with A-GPS support and GLONASS and Java via Java MIDP emulator. You can touch anywhere on the screen to take a shot using camera, capture panoramic pictures or record video and share it with your friends and family with just a few taps. You can charge the phone with both the USB cable and non-detachable charger. The Motorola Alert allows you to set up periodic alert notifications for certain people with place presets like Home, Office and School. The dual sim android smartphone runs on 2G frequency of GSM 850 / 900 / 1800 / 1900 and 3G frequency of HSDPA 2100. The phone doesn’t support 4G LTE network. The audio playing formats supported are AMR-NB, AMR-WB, AAC, AAC+, eAAC+, MP3, PCM, FLAC, MIDI, QCELP, EVRC, OGG/Vorbis while video playing formats supported are DivX, WMV, MP4, H.263, H.264. The preinstalled apps include Google Search, Maps, Gmail, YouTube, Google Talk and Picasa. The other features supported are Photo Viewer and Editor, Voice memo dial, Organizer, Predictive text input and SNS integration. Also check Xolo Q2000 Quad Core 3G Android Phablet Smartphone Features, Specifications, Images, Photos, Comments, Details, Review and Price in India. 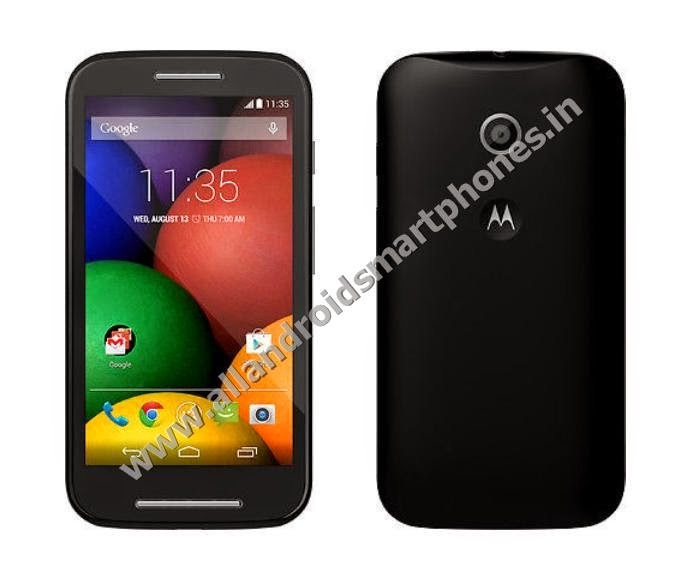 Features and Specifications of Motorola Moto E XT1022 Android Smartphone. 166.9 x 84.3 x 9.9 mm. Dual-core 1.2 GHz Cortex-A7 CPU. Adreno 302 400MHz single-core GPU. microSD card up to 32 GB. 4 GB memory & 1 GB RAM. 540 x 960 pixels resolution. DivX, WMV, MP4, H.263, H.264. AMR-NB, AMR-WB, AAC, AAC+, eAAC+, MP3, PCM, FLAC, MIDI, QCELP, EVRC, OGG. Google Search, Maps, Gmail, YouTube, Google Talk, Picasa. Photo Viewer and Editor, Voice memo dial, Organizer, Predictive text input and SNS integration. Non-removable Li-Ion 1980 mAh Battery. Mixed usage up to 24 hours. The Price of Motorola Moto E XT1022 Dual Sim 3G Android Smartphone online on flipkart is around Rs. 6,999 /- only.